Around week 14 of my pregnancy, my belly was so itchy, I was scratching like a truck driver. I knew it wasn’t cute, so something had to be done. My copy of What to Expect When You’re Expecting told me the itchiness was normal since my belly skin was stretching rapidly, and it actually warned against scratching, as that might cause irritation. The suggested relief was to apply a gentle moisturizer frequently and liberally, so I started lubing my abdomen with my usual lotion after showers or anytime I was especially itchy. One day, I was visiting one of my best friends who is a mother of two, and she caught me giving my side a little scratch with my thumbnail. She asked what I was using to moisturize my belly, and I told her just my regular-old lotion. 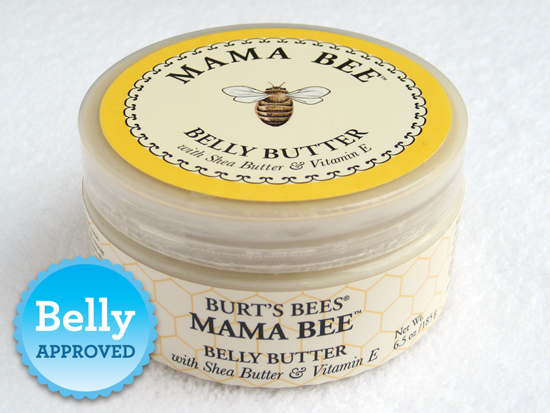 “Oh, you need Mama Bee Belly Butter,” she insisted. “It’s made by Burt’s Bees.” I said I’d look for it and promptly forgot. A few weeks later, she surprised me with a tub of the stuff, and I haven’t been nearly as itchy since. I guess the combination of cocoa, shea and jojoba butters really does the trick to keep a pregnant belly smooth and supple. It’s natural, as most of Burt’s Bees products are, and fragrance-free, which I really appreciated in those earlier days when I was still nauseated by perfumey smells. The 6.5-ounce container will probably last me through the rest of my pregnancy and beyond, so I’d definitely say it’s worth the $13 it usually costs, even if I’d had to pay for it myself. Speaking of not paying for things yourself, how would you like to win your very own Belly Butter? We have three tubs to give away to three different lucky readers in the United States. You’ll have through Monday, Feb. 18, 2013 at 11PM EST, to enter. Winners will be notified by email. If you didn’t win this time, don’t worry, there will be more contests and sweepstakes to come! Click here to join our email list and we’ll email you about the next contest. Note: We are NOT associated with Burt’s Bees and are not receiving any compensation for this contest.